Nina Katchadourian’s ongoing Seat Assignment project makes use of the most basic of materials – a camera phone, scarves, tissues – anything, in fact, readily available on board a plane during a longhaul flight. 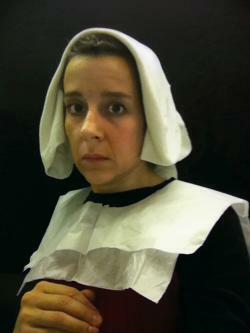 Locking herself in the toilet, Katchadourian then takes self-portrait photos on her phone (the sort of things that pepper a Facebook profile page) in the style of fifteenth century Flemish portraiture, of the kind exemplified by painters like Hugo van der Goes or Jan Van Eyck. 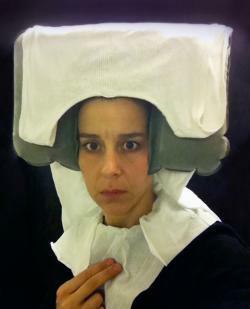 An inflatable neck cushion, a vest draped over it, becomes a makeshift headdress; a paper toilet seat cover stands for a plain white collar. A scarf or jacket hung in the background recreates the inky depths of a painted setting. The artist then recreates the solemn expressions of the Flemish sitters – their expressions designed to convey humility, or devotion – and their delicate gestures: hands held with symbolic exactitude. The DIY and speedy nature of the making of the images is at deliberate and comic odds with the meticulous naturalism and time-consuming construction of the Flemish paintings, and the stone-faced piety of the source images is wittily undercut by the use of materials associated with bodily functions. Katchadourian’s images go further than mere one-liners, though. By drawing parallels between two divergent attitudes to the power of the portrait – the Old Master belief in its ability to generate an eternal memory, versus the contemporary ubiquity and banality of the selfshot portrait – Katchadourian’s works address the notion of time in the images we make of ourselves. The faith (that the image will survive us) is the same; nothing, in the end, has really changed. Tech Tools of the Trade, Contemporary New Media Art, di Saisset Museum at Santa Clara University, Santa Clara, California. Space is the Place (2006-2008), organized and circulated by iCI (Independent Curators International), New York. Museum of Art, University of Richmond, Richmond, Virginia. Speed of Life, Artnode, Stockholm.